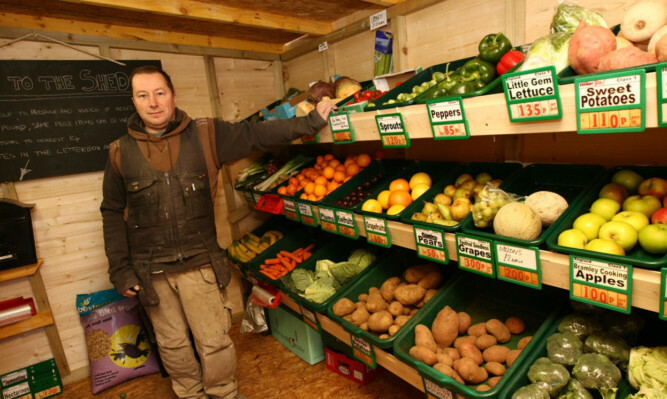 Clem with some of the vegetables he will be selling through his honesty shed. An East Neuk village could uproot Musselburgh’s claim to the title of Honest Toun. Crail’s integrity is being tested by its local grocer while his shop is closed for refurbishment and so far it is a tale of success. Instead of letting his customers down while he shut his doors for six weeks, Clem Green stocks up a shed next door with fruit and vegetables and lets people dig in. Customers weigh their own produce and pay for their shopping by putting money in an honesty box. Instead of worrying that his takings will be short, Clem reckons his customers are so trustworthy his float is more likely to be up a few pounds or pence than down. Confident not a single carrot or leek will go unaccounted for he said: “None of the locals would ever touch anything. “They are more likely to put in a little extra than to take anything without paying. Joiner Clem took over the long-established High Street South green grocery last summer and is carrying out the refit himself. He surveyed customers before opening the honesty shed and the idea was a hit. He said: “It helps me and them at the same time. I didn’t want my customers to go elsewhere while I was closed. However, he gave assurance that the shed was a temporary measure and business will resume as normal soon.